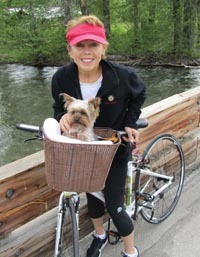 Courtesy photo Janit Karrys rides a bike with her “five-pound nurse,” Paisley. How would your attitude toward life change if you knew you only had a short time to live? The question is not a hypothetical one for someone facing a potentially terminal illness. “Cancer has a message, but you don’t always get it at the beginning,” said Ketchum resident Janit Karrys, who was diagnosed with Stage lV ovarian cancer two years ago. Karrys, 59, suffered from uncomfortable bloating, back soreness and lack of energy for two years before discovering that she had cancer. She said she was misdiagnosed with kidney stones, food allergies and other maladies before a CT scan discovered tumors. One week later she had the tumors removed. “I lived on anti-anxiety pills until after surgery,” Karrys said. Yet the cancer had already spread to other organs in Karrys’ body. Her oncologist told her she had daunting odds for recovery, and she continues to undergo chemotherapy, including an experimental treatment. Her husband, retired Manhattan attorney Richard Wilsker, helped her filter information and make decisions after she was diagnosed. He also helped her avoid well-meaning efforts by her friends to provide alternative treatments that could have interfered with chemotherapy. “The importance of having a loyal and supportive companion who loves me has been tremendous,” she said. Karrys said she tires of hearing stories from well-meaning people who want to share stories about their relatives and friends who have had cancer. She keeps a poem she found last year at the Sun Valley Wellness Festival, written by a 78-year-old cancer survivor named Beverlye Hyman Fead. She said portions of it capture very well the feeling she has toward friends. Karrys said her condition has been responsible for many changes in her life, including repairing a relationship with her brother, with whom she had not spoken for 15 years. One of her greatest joys has been her Yorkshire terrier, Paisley, who is with her at all times. Karrys said she wants to help others with cancer, and perhaps work with children. “Maybe telling my story is part of my healing by helping others,” she said. Two years after being diagnosed with cancer, and numerous chemotherapy and radiation treatments later, Karrys is still skiing and making plans for her future, and letting go of some vexing problems from her past. Last week, she discovered some old journals in a closet and burned them. “I no longer care about some old angst over an ex-boyfriend, what I should have done or didn’t do, or a job I didn’t get. Burn, baby burn, I say. For Karrys, that means measuring her once-abundant energy into smaller packages, and timing her adventures to take place between bouts of chemotherapy. In years past, she rode her BMW motorcycle to Baja California in Mexico and back. She still skis moguls and the steepest hills on Bald Mountain, but only after debilitating, yet life-saving, chemotherapy treatments in the hospital. Karrys said chemotherapy, at times taken intravenously for five days consecutively, causes debilitating nausea and saps her energy for a week afterward, but that she feels lucky to have it. “So many people worldwide just don’t have the opportunity to access this level of health care,” she said. She said working with a psychologist who had cancer has been beneficial as well, as is using alternative therapies such as acupuncture, massage and healing touch energy therapy. Karrys attributes keeping physically fit as being essential to her emotional and physical health. Karrys and her husband researched new clinical trials, with potentially newer and more effective forms of chemotherapy, before settling on one in Bethesda, Md. “The cost will be covered by the National Institutes of Health. The last one we wanted to join would have cost $1 million,” she said. Keeping a plan for the future keeps Karrys hopeful. She and her husband have plans for the three-week period following her first treatment in Maryland. They will fly from the East Coast to Paris and then hike, bike and eat their way across southern France. “I always have a trip planned for after a treatment,” she said. “That’s my carrot. After all, we’re still foodies, and a glass of wine or two never hurt.